These are plants that need a little space in the garden, Phygelius are tall, to over 1m and do spread slowly from suckers. We have been growing them for over 10 years and every year or two we do reduce the clump back to size, a fairly easy task. As we do not get frost, although we do have cool to cold winters they never die back and only require an annual pruning to keep in shape. 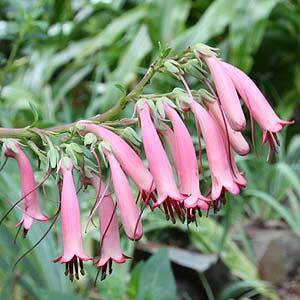 The two species Phygelius aequalis or ‘Yellow Trumpet’ and Phygelius capensis with its dusky pink flowers is also known as the ‘Cape Fuchsia’ are both from South Africa. These are an evergreen perennial suitable for sun or semi shade. Because of their height both species can look great at the rear of the border. Frosts are a problem, however plants can be cut back and will reshoot. A well drained humus rich soil is best. Long flowering evergreen perennial with yellow or red trumpet shaped flowers from summer through to autumn. Prefers a sunny position. Prune back by 50% in winter to maintain shape. Will reach nearly 1m. Take cuttings in summer. Cultivars include P. Raspberry Swirl, P. ‘Moonraker’, Phygelius x rectus ‘African Queen’ and P. ‘Salmon Leap’.